The 2018 harvest could have gone very, very wrong for Cloudy Bay, most recognised for their Sauvignon Blanc from New Zealand. It is also a year which wine lovers can expect to taste exceptionally good New Zealand wines. Jim White, the Technical Director for Cloudy Bay tells us why. The year’s harvest was discussed while we paired the Sauvignon Blanc 2016, 2017, 2018, and the Te Wahi 2015 with a menu specially surrounding the 5 elements of water, earth, metal, wood and fire curated by Olivier Pistre, Executive Chef at Lafite, Shangri-la Kuala Lumpur. 2018 was the warmest spring that the Marlborough vineyards have ever had. It was also a year where the production volume for Cloudy Bay’s signature blend reduced by 20% compared to the previous year. “Typically, spring in New Zealand is punctuated by cold wind from the Antarctica to little protected Marlborough, but this year it was surrounded by warm sea water with temperatures at 5 or 6 degrees above average,,” said the viticulturist. 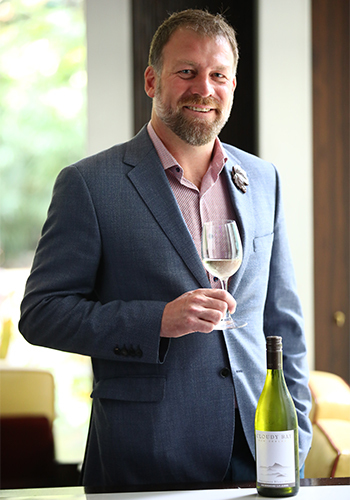 The brand has a tradition of releasing their Sauvignon Blanc on the 1st of October every year, and this year Malaysia is the first market to receive it. This year’s vintage has a lot more concentration of flavours compared to the 2017, with a much broader spectrum of flavours as a result of the warmer climate earlier in the year. “Due to the warmer conditions, the vine maturity accelerated with flowering 10 days earlier than normal. December continued to be warm and extended into mid-January when it started to rifle,” White explained. The accelerated maturation received a massive rainfall of 250mm in February which could have spelled disaster in most regions in the world, but Cloudy Bay was saved by its free draining soil. The harvesting team had to walk away from 12 months of hard work and it was not only heart breaking for them, the insufficient grapes also meant a financial impact to the business by not making enough wine. However, it was not all hopeless. “Mother Nature is a cruel and kind master and this sort of collateral damage is something we have to deal with but the result in the bottle is amazing! It has the level of ripeness and concentration that has never been tasted in Cloudy Bay’s Sauvignon Blanc for many years,” says White. 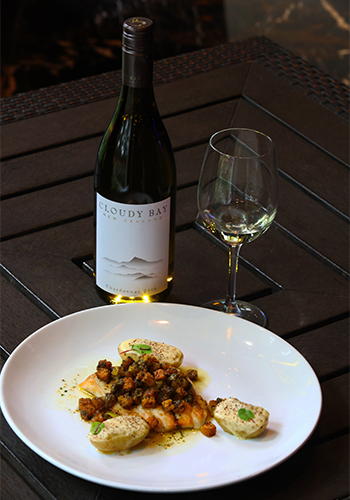 The Cloudy Bay Sauvignon Blanc 2018 is aromatic with a bright citrus note on the nose and the signature passionfruit ripeness. The concentrated stone fruit and tropical characters are distinct on the palate. It has a mouth-watering effect with a lingering intense lemony finish and a build-up of minerals that prolongs the taste profile of the wine with every sip. During the same session, White introduced the latest wine to their portfolio since 2014, something they have not done since 1996 when they added Te Koko as the sixth wine. This is also the first time Cloudy Bay made a wine with grapes outside of Marlborough. Te Wahi uses grapes from Central Otago, a concept from 2010 when the brand wanted to make a wine that is more masculine with the intention of focusing on the architecture and structure with great ageing ability. They started by buying grapes from this region to experiment with and in 2014, bought in on their own in this region to produce a pinot noir that is big with rich, ripe fruit characters. 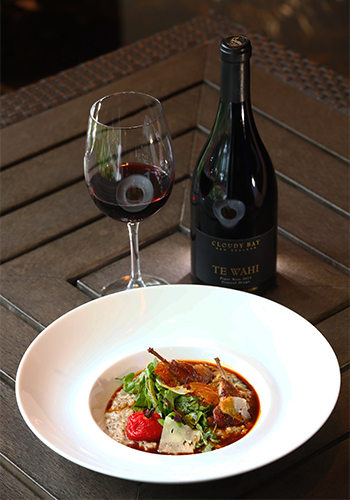 Te Wahi means “the place” in Maori language and the name was chosen because pinot noir always speaks of the place it is grown. “It is a very hard place to grow grapes in Central Otago,” says White. “The climate is much harsher compared to the relatively gentle climate in Marlborough, it is high mountains, low rainfall, freezing cold in winter and gets quite warm in summer during daytime and cool at night, making it an interesting climate to produce a pinot noir with great character and finesse”. The grapes for Te Wahi were harvested in the beginning of April 2015. It was aged in French oak barrels for 12 months and in bottles for nine months until its release on 1 June 2017. The colour is dark and brooding, tasting like ripe cherries and spice with minerality on the palate but still retaining the freshness. It’s not too weighty as the tannin is light with a slight acidity. The finish is long and complex but can be sipped continuously without feeling too heavy.